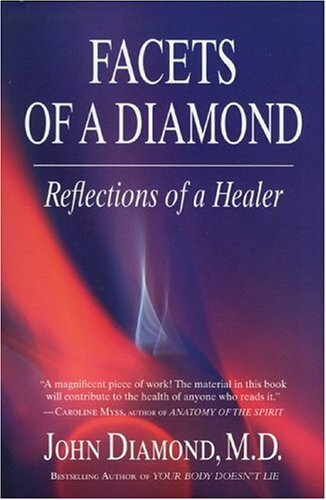 Facets of A Diamond — Reflections of a Healer by John Diamond, M.D. John Diamond must get tired of all the witticisms surrounding his name, but I have to say it… this book is a gem! Facets of a Diamond is both an excellent memoir and a guide to how to heal ourselves and others. This is the best of “alternative medicine” from an author who knows it inside and out. Not only that, but John Diamond knows traditional medicine, with all its downfalls and limitations. He first trained as a psychiatrist and spent several years working in the mental health systems in Australia and New Zealand before he renounced psychiatry as being too cruel and heartless. His decision to refute modern Western medicine, and to search elsewhere for his healing modalities, is all the more compelling for this reason. From the author’s perspective, the people who come into his office are not “patients” but are sufferers, and he believes that all suffering is spiritual in origin, even if it is manifesting physically. Something, or several things, happened that resulted in a diminishment of the sufferer’s Life Energy. John Diamond’s goal then, is to help the sufferer rekindle or strengthen that Life Energy force. This re-kindling must come from within, but the author does everything he can as a healer to help the person help themselves. This includes providing a lovely healing environment, a loving healing attitude of being present, and then whatever the author feels intuitively inspired to include in the therapy. This may be nutrition advice, meditation, acupuncture, chanting, singing, working with musical instruments, and so on. Invariably, one of the key elements of the therapy will be some effort to remind the sufferer of his “Belovedness.” Readers who are familiar with Diamond’s other works, such as his latest, The Diamond Color Meditation, will recognize this concept. The author believes, and makes a strong case for, the original loving bond between Mother and child as the key to spiritual health — which means all health. According to this view, we forget that we are loved — by God, by the universe, by our Mother, and it is this forgetting that diminishes our will to live. This is an important concept, and indeed, the author may be on to something. Readers who don’t have a great relationship with, or memory of, their mothers may have a little trouble with this, but the author goes to great lengths convincingly to overcome doubts or disbelief. This is the goods — very deep, and very healing. According to the author, it is only when we remember the love and perfection of our mothers that we can begin to see the love and perfection of ourselves. Facets of a Diamond is written not only to explain the author’s background and healing modalities, but to initiate healing within the reader. This is a very activating or energizing book, written with a poetic sense of pacing and language, guaranteed to raise the Life Energy of the person reading it. John Diamond plays with the text and the blank page as if he were painting a canvas, or putting down notes of music — all deliberate, and all a part of the “High Art” that he feels is most linked to God, or our most loving, creative, perfect state. Throughout Facets of A Diamond, the author uses anecdotes and actual case histories to illustrate many of his concepts, and it all makes for fascinating reading. There are also some unfortunate examples of cases where traditional Western medicine failed many of these people. All the more reason to be grateful for other options, and for doctors like John Diamond who care enough to devote a lifetime to finding them. Dr. John Diamond, M.D., D.P.M., F.R.A.N.Z.C.P., M.R.C.Psych., F.I.A.P.M., D.I.B.A.K., is a pioneering figure in alternative and holistic medicine. His remarkable body of work embraces a wide range of disciplines, the result of over forty-five years of research and clinical practice. He began his career in psychiatry but expanded into holistic medicine.One of the foremost senior holistic healers, he now practices as a Holistic Consultant and blends his experience in medicine, psychiatry, complementary medicine, the humanities, holism, applied kinesiology, acupuncture theory, spirituality and the arts, especially music, to help people overcome problems relating to body, mind and spirit.